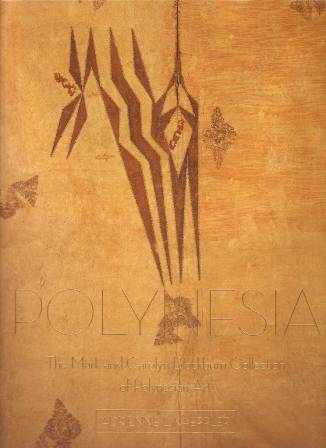 The visual arts of Polynesia offer a richly diverse and relatively little known body of work, covering an enormous geographical area yet linked by shared artistic conventions. The collection of Mark and Carolyn Blackburn, one of the greatest private collections of Polynesian art in the world, encompasses this broad field of artistic endeavor. It features both ceremonial and functional traditional forms in diverse media, from delicate ivory ornaments and decorated barkcloth to formidable weaponry and imposing sculpture in coral, wood, and stone. The geographic spread of the collection is vast, covering the Pacific Ocean from Hawai‘i to Rapa Nui (Easter Island) to ‘Aotearoa (New Zealand), and the many islands in between. Many of the pieces have noteworthy historical antecedents, such as items associated with the eighteenth-century voyages of Captain Cook, and the Dupetit-Thouars material from the Marquesas, first collected by the nineteenth-century French admiral of that name. In this book, for the first time, these unique works of art are on display, fully described and annotated, for the enjoyment and appreciation of scholars, collectors, and interested readers alike. Selected paintings, drawings, engravings, and photographs from the Blackburn collection give context to the artifacts and essays. Items from each geographic and cultural area are described within their cultural and historical context: ‘Aotearoa (New Zealand), the Austral Islands, the Cook Islands, Fiji, Futuna, the Gambier Islands, Hawai‘i, Malden, the Marquesas Islands, Niue Island, Nukuoro Island, Rapa Nui (Easter Island), Rennell Island, Rotuma Island, Samoa, Tahiti, Takuu, Tokelau, Tonga, and the Tuamotu Islands. In Polynesia, the visual arts and their associated objects serve as physical representations of the underlying aesthetic, social, and religious aspects of the island cultures. In some cases, these eloquent objects may be all that remains to speak of these once-living traditions. This publication allows these remarkable works to communicate directly with the modern viewer. Adrienne Kaeppler is curator of Oceanic ethnology at the Smithsonian Institution in Washington, D. C. She has carried out field research in Tonga, Hawai‘i, and elsewhere in Polynesia. Renowned for her work on the ethnography and collections from Cook’s voyages, she continues to focus on connections between social structure and the visual and performing arts.